ZJY Series Shaft Mounted Gearbox Reducer is mounted directly in a way of hanging on the dynamic input shaft of matching master machine, which dispenses with the connecting accessory and decelerator erection platform. It is applicable for the mechanical drive of bucket elevator,belt conveyor, and flight conveyor, as well as matching with other similar master machine. ZJY Series Shaft Mounted Speed Reducer is manufactured according to JB/T9050.1-1999 standard, and main drive components are made of quality alloy steels. Gar wheel is processed with carburizing and quenching and grinding teeth with precision of Class6(GB10095.1-2001). The gearbox reducer is compact size with high carrying capacity, long service life, low noise, and high efficiency. ZJY has the same output torque as ZJ shaft mounted gearbox. ZJY weights only 30% of ZJ, therefore, the rigidity required for the master machine frame is significantly decreased, and ZJY drives stably. Not only ZJY series shaft mounted speed reducer can be operated double direction, but also can be equipped with anti-runback device to achieve one way braking. 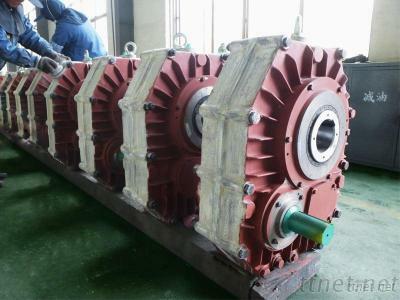 Note: The key of input shaft and hollow shaft is according to GB/T1096-2003.